Andrea Benjamin earned her Ph.D. from the University of Michigan in 2010. Her research interests include Race and Politics, Local Elections and Voting behavior, and Public Opinion. Her first book, Racial Coalition Building in Local Elections: Elite Cues and Cross-Ethnic Voting, explores the potential for Black and Latino Coalitions in local elections. Using the Co-Ethnic Elite Cues Theory, the book shows that Blacks and Latinos rely on endorsements from co-ethnic leaders when casting their ballots. This is especially true when race and ethnicity are salient in the campaign. This book is available from Cambridge University Press and Amazon. Andrea Benjamin is currently working on a project about Black and Latino coalitions in Durham, NC. 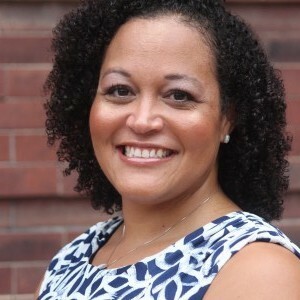 Andrea Benjamin is originally from Northern California and completed her undergraduate degree at the University of California, Davis. My research focuses on scholarship in American Politics and broadly speaks to Race and Politics, Voting Behavior, Identity, Endorsements, Local Politics, Experiments, and Racial Attitudes. More recently, using both qualitative and quantitative methods, I have been interested in focusing on the multi-faceted puzzle of Black and Latino voting behavior in local elections from multiple perspectives and offer an elite driven theory, the Co-Ethnic Elite Cues Theory that helps explain the variation in vote patterns observed in recent elections. The population of the United States is changing and, in many of the major cities, this means greater racial and ethnic diversity. Previously, scholars focused on cities as the sites to study the ways new groups incorporate into the political process. Scholars found that groups relied heavily on their own ethnic identity when casting their ballots. Additionally, working with other groups to form coalitions was an important strategy for new groups to gain access to the political power structure. Yet, even as we have seen the racial and ethnic composition of cities change, there has been little focus on the relationship between racial and ethnic identity and political behavior. Recent mayoral elections in Chicago, Houston, Los Angeles, and New York show that racial and ethnic groups often do vote together as blocs. Given their shared status as minorities and their shared experiences with discrimination, some scholars suggest that Blacks and Latinos might be natural partners, while others have found that their negative feelings towards one another prevent them from forming alliances altogether. On this point, the recent mayoral elections show a mixed pattern of cross-ethnic voting (out-group candidate support) and suggest the reliance on coalitions or alliance formation may no longer be a favored strategy. Many mayoral elections are non-partisan and voters may not have a lot of information about the candidates. My work seeks to explain these differences in vote behavior observed in Chicago, Houston, Los Angeles, and New York. What explains the variation in vote choice among Blacks and Latinos in these mayoral elections? I have developed the Co-Ethnic Elite Cues Theory to explain these differences in voter behavior. Research ProjectsInformed by the issues relating to race, politics, and voting behavior described above, my current research encompasses a book and a set of related articles on the Co-Ethnic Elite Cues Theory that I developed. I also describe some of the other articles I have completed that contribute to my research agenda. The motivating puzzle discussed above has shaped my research agenda. While ethnic politics was once a major focus in political science, this is no longer the case, even as cities are growing more ethnically diverse. Most city elections are non-partisan and often voters have very little information about the candidates. Under the right circumstances, racial and ethnic identity still matters in local elections and, as a result, endorsements from members of a shared racial/ethnic group can provide voters with a useful cue or heuristic in the voting booth.In Racial Coalition Building in Local Elections: Elite Cues and Cross-Ethnic Voting, I consider the puzzle of Black and Latino electoral coalitions in mayoral elections. Given their shared status as minorities and their shared experiences with discrimination, some scholars suggest that Blacks and Latinos might be natural partners, while others have found that their negative feelings towards one another prevent them from forming stable alliances. If one group is not the numerical majority in the city, political elites may rely on coalitions as a route to ensure their group or someone who will help their group has access to politics and political benefits. Coalitions are most likely formed when there is a shared set of interests between groups. Once a coalition has been formed, I argue that co-ethnic elites signal this coalition to voters via endorsements. These endorsements are meant to convey the message to voters that this candidate is good for our group. Voters will be most receptive to this message when they are thinking about race and ethnicity. I present the Co-Ethnic Elite Cues Theory to explain how groups can gain access to political benefits for their own members, particularly when an in-group candidate or co-ethnic is not an option. The Co-Ethnic Elite Cues Theory helps us understand when cross-ethnic coalitions emerge and when they do not. I use a multi-method approach to test my theory using exit poll data, newspaper coverage, experimental data, and survey data to show its relevance by revisiting recent elections in several major US cities. By looking at a number of recent elections across the major cities of our country, I demonstrate that cross-ethnic minority voting coalitions are an important element in deciding who becomes mayor, which groups are incorporated into politics, and how voters respond to the campaigns. I explore these dynamics by looking at how voters respond to elite cues and how elite-level strategists anticipate the reactions of voters. My findings suggest that Blacks and Latinos are willing to engage in cross-ethnic voting under certain conditions. In an experiment fielded among Black and Latino adults, I vary the race of the candidate, the presence of co-ethnic endorsements, and the racial/ethnic salience of the campaign. I show that the theory works quite well for Blacks. When presented with a Latino candidate, with a Black endorsement in a racially salient campaign, Black subjects overwhelmingly supported the Latino candidate. These results lead me to conclude that Latino candidates need to seek out Black endorsements in order to win over Black voters. Latino candidates can do even better among Black voters when race is salient. White candidates need endorsements and race to be salient in order to win the Black vote. The pattern among Latinos is mixed. While Latinos did not prefer any of the candidates, regardless of endorsements, race of the candidate, or the ethnic saliency in campaigns, they were willing to indicate that an endorsed Black candidate was more sympathetic to Latino issues; and this effect held whether ethnicity was salient or not. Additionally, Latinos believe that the White candidate with a Latino endorsement when ethnicity was salient is extremely sympathetic to Latino issues. Building on these results, I test the Co-Ethnic Elite Cues Theory in a real-world election (the Los Angeles Mayoral Election of 2013). I measure vote choice and knowledge of endorsements and show that Blacks in Los Angeles used co-ethnic endorsements when casting their votes, even when I control for partisanship, ideology, and issues. Among Latinos, the data in Los Angeles the relationship is weaker, just like in the experiments. While Latinos relied on some Co-ethnic endorsements when casting their vote (the Spanish language newspaper), other endorsements were not as persuasive (those from politicians and celebrities).I then test the Co-Ethnic Elite Cues Theory further with additional experimental data using a nationally representative sample of Black, Latino, and White adults. I manipulate the race of the candidate and the presence of a co-ethnic endorsement, but I also have a treatment where the candidate asks voters to support him in the context of a Black-Latino coalition. Blacks and Latinos do not distinguish between the co-ethnic endorsement treatment and the treatment with a co-ethnic endorsement in the context of the coalition, so I combine them for the analyses. I find that Blacks and Latinos are both more likely to vote cross-ethnically when there are co-ethnic endorsements in the context of a Black-Latino coalition. I also explore how White voters respond to these Black and Latino candidates, the Black and Latinos endorsements, and calls to support a Black-Latino coalition. Here I find that White voters are not supportive of Black candidates, but do not differentiate between Latino candidates. Taken together, these results suggest that Blacks and Latinos are open to out-group candidates with endorsements and these candidates can actually highlight a Black–Latino Coalition, without being penalized by White voters. As final test of the theory, I consider the relationship between treatments and racial attitudes among Blacks, Latinos, and Whites. Using a nationally representative sample, I show there are some conditions where co-ethnic endorsements lead Black respondents to feel more positively towards Latinos, but this is less true for Latinos. Overall, racial attitudes do not change in light of co-ethnic endorsements. Additionally, I show that Whites’ attitudes about Latinos do not change, even why they are working with Blacks. Negative feelings about Blacks increase when a Black-Latino coalition has been formed around a Black candidate. This adds a new perspective on the debate about Racial Attitudes among Blacks, Whites, and Latinos. In “Making Coalitions. Picking Winners: How Political Organizations Influence Local Elections” (with Alexis Miller) at Urban Affairs Review. In this paper, we delve deeper into the relationship between endorsements from local organizations and vote choice in a city council election. We use the 2015 city council election in Durham, NC to provide insight into the process by which organizations and newspapers decide which candidates to endorse, provide evidence to show that candidates believe these endorsements are important, and test the claim that voters rely on endorsements even when we control for factors such as partisanship, ideology, income, and education. Given that voters may decide to support one candidate over another based on a candidate’s issue positions, we also test the claim that issue positions explain vote choice better than endorsements. We rely on interview data and exit poll data to test our claims. We take advantage of an at-large municipal election, in which voters could select up to three candidates. We find that endorsements explain vote choice for voters’ second and third choice candidates and issues do not explain vote choice as well.In “Revisiting Political Incorporation: Black Electoral and Policy Inclusion in the Bull City. The Two Dimensions of Political Incorporation: Black Politics in a Majority-Minority City,” I seek to unpack the notion of political incorporation using Durham, NC as a test cast. In that election, Black voters had a specific set of candidate preferences and those did not translate into the election of their preferred candidate. Instead, White progressives got a new Black candidate elected to the council. While this provided new descriptive representation, I ask what it means for policy incorporation. That is, does it matter that Black voters didn’t support that Black candidate if that person seeks to improve the conditions of Blacks in the city through their policy preferences? I also ask what role Black organizations play in the changing city and what this means for the growing Latino population in the city. Endorsements have become a part of most election cycles. They come from a variety of sources (civic organizations, elected officials, newspapers, etc.) and are intended to signal voters that one candidate is preferential to another. Yet, there is still a lot that we do not know about endorsements. In this article, we provide insight into the process of how organizations and newspapers endorse candidates, provide evidence that demonstrates candidates believe these endorsements are important, and test the claim that voters are aware of these endorsements even when controlling for factors such as partisanship, ideology, and education. We also test the claim that issue positions explain vote choice better than endorsements. We rely on interview data and exit poll data to test our claims. Using data from an at- large municipal election, in which voters selected up to three candidates, we find that awareness of endorsements explains vote choice better than issues. Black and Latino voters support coethnic candidates at high rates in local elections. What is less clear is how Black and Latino voters respond to out- group candidates when they do not have the option to support a coethnic candidate. I posit that when race and ethnicity become salient in a campaign, endorsements from Black and Latino leaders and organizations increase support of out-group candidates among Blacks and Latinos. I find that this hypothesis is strongly supported among Blacks. However, the same is not true for Latinos, most likely because of the political heterogeneity of the group. Using data from a survey experiment, I show that Black endorsements of minority out-group candidates are persuasive for Blacks, while comparable endorsements from Latinos are not as influential among Latinos. This book examines racial and ethnic coalition building in local elections and considers Black and Latino political incorporation more broadly. Although many argue that Black and Latino voters have much to gain from alliances that advance shared interests, coalitions between the two groups have not always formed easily or been stable over time. Recent mayoral elections across the country show different patterns of out-group candidate support. This book seeks to explain these variations and the specific conditions under which Blacks and Latinos vote for the same candidate. Drawing on large-n observational data, survey experiments, and qualitative case studies, Andrea Benjamin develops a theory of co- ethnic endorsements, which points to the significance of elite cues from Black and Latino leaders. This book demonstrates that voters use elite co- ethnic endorsements to help inform their votes, that they do so particularly when race is salient in an election, and that this has real implications for representation and access to political benefits.